A quirky Christmas tradition, the legend of the Christmas pickle is said to be an Old German holiday tradition that has been slow to spread to other parts of the world. The thing is, if you were to ask your old German grandmother to tell you about the tradition of the Christmas pickle and how her family used to celebrate it back in the old country, she would probably shrug her shoulders. Not many Germans, in fact, know about this odd and whimsical Christmas custom. Is it really an obscure tradition? Or is it a modern-day custom cleverly disguised as an antiquated one for marketing purposes? What is a Christmas Pickle? According to the stories that are told today, the Christmas pickle, known as die Weihnachtsgurke, was an old German tradition. Each family had one special Christmas ornament, usually made of glass, fashioned into the shape of a pickle. It was even painted green. This pickle ornament was hidden somewhere on the Christmas tree, camouflaged among the evergreen boughs. The first child to find the elusive Christmas pickle on Christmas morning received a special gift. Germans Don’t Know About the Christmas Pickle? In more recent years, as the quirkiness of having a pickle featured prominently in a Christmas tradition attracted more and more attention in the United States, Americans started questioning their German friends and family. Overwhelmingly, they were met with puzzled looks. 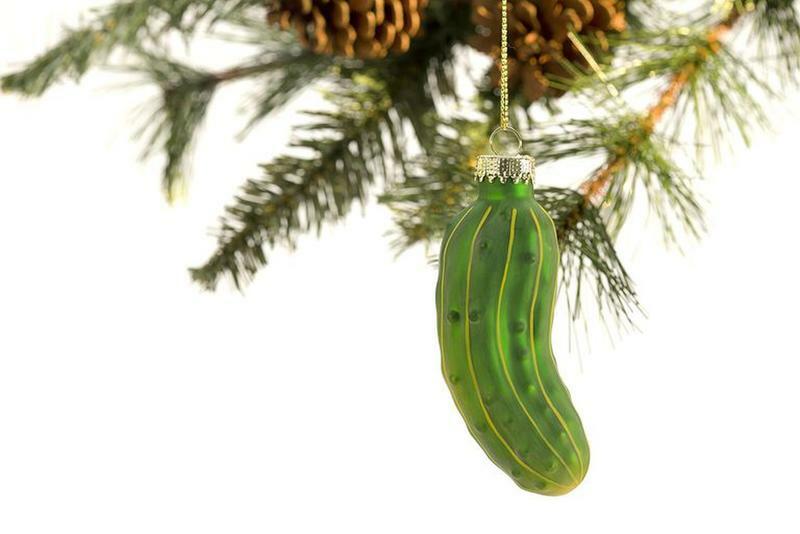 It seems like the Christmas pickle was not a well-known German custom. In fact, in 2016, the New York Times published the findings of a survey of more than 2,000 German natives that asked about their experience with the Christmas pickle. Ninety-one percent of the people surveyed had never heard of the tradition before. How is this possible? 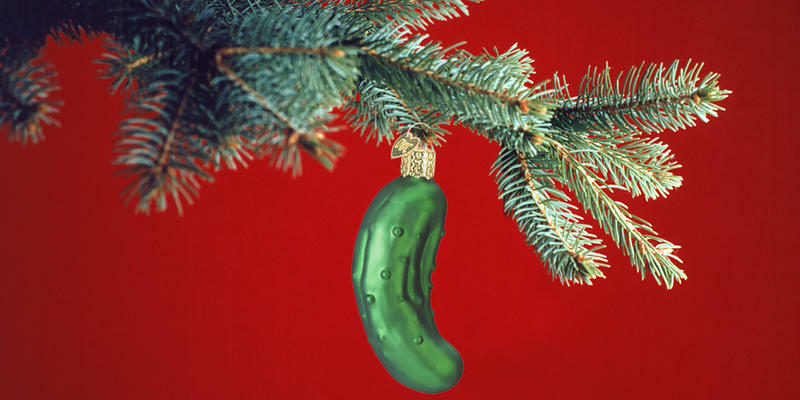 What is the origin of die Weihnachtsgurke, the Christmas pickle? Is it Really Based on a Spanish Tale? One theory to explain the origin of the Christmas pickle custom is that it really began in Spain, not Germany. Three young Spanish lads, so this story goes, were traveling home from their boarding school to be with their families for the holidays. Along the way, they stopped at an inn for the night. The crazed innkeeper kidnapped the boys…in some versions of the story, the boys were killed…and stuffed them into a pickle barrel. 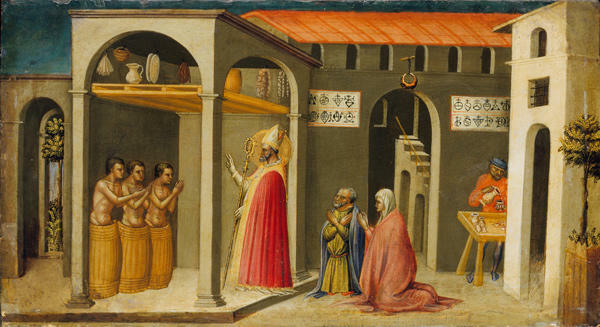 Later that same night, Saint Nicholas stopped by the inn. He discovered the boys in the barrel and freed them…or revived them, depending on the story. The grateful Spanish boys took to hanging a pickle-shaped Christmas ornament on their tree every year to remember the kindness of Saint Nicholas. But this is a Spanish story, not a German one. And many versions of the story claim that the barrel was stuffed with meat, not pickles. Does the Christmas Pickle Stem from a Civil War Incident? During the American Civil War, according to this theory of the Christmas pickle, a pickle-loving soldier was wounded and captured somewhere in Georgia. His injuries were grave and as he lay dying, he begged the prison guards to grant him his dying wish. He wanted a pickle. 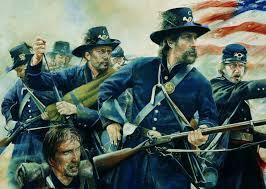 The guards tracked down a pickle for the dying soldier. Miraculously, the pickle gave him strength and he quickly healed from his deadly wounds. He was later released and returned to his home. Every Christmas after that, he hung a Christmas pickle on this Christmas tree to remember the kindness of his captures and the healing power of a pickle. The strange thing about this version of the Christmas pickle story is that it lacks any connection to Germany. 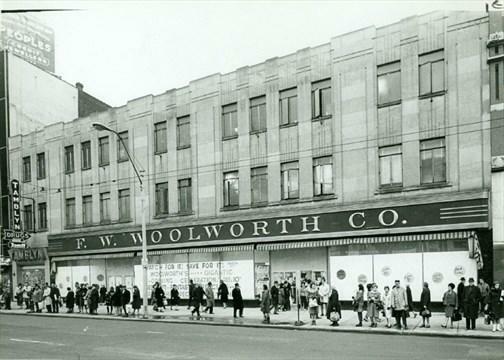 Sometime around the late 1880s, Woolworth stores across the country started selling glass Christmas ornaments from Germany that were shaped like various fruits and vegetables. Customers loved the glass grapes and apples, but the pickles…not so much. Stores were often left with an abundance of pickle ornaments that they couldn’t unload. A clever sales clerk, according to this theory, began telling his customers that the Christmas pickle was a quaint, old-world holiday tradition as a way to get folks to buy the unwanted ornaments. He must have been some salesman because his marketing ploy worked. He shared his gimmick with managers of other Woolworth stores and, amazingly, people bought into the idea of the quirky die Weihnachtsgurke and wanted their own Christmas pickle ornament. Berrien Springs, Michigan, in the state’s southwest corner, bills itself as the Christmas Pickle Capital of the World. The area around Berrien Springs was settled by German immigrants, many of whom started farming cucumbers. A pickle packing industry grew in the town in the early 1900s. In the last few decades, the folks at the Berrien County Historical Association latched onto the Christmas pickle story because it combines two elements of the town’s past. There is an annual Christmas Pickle Festival, complete with a Pickle Parade, held in early December. 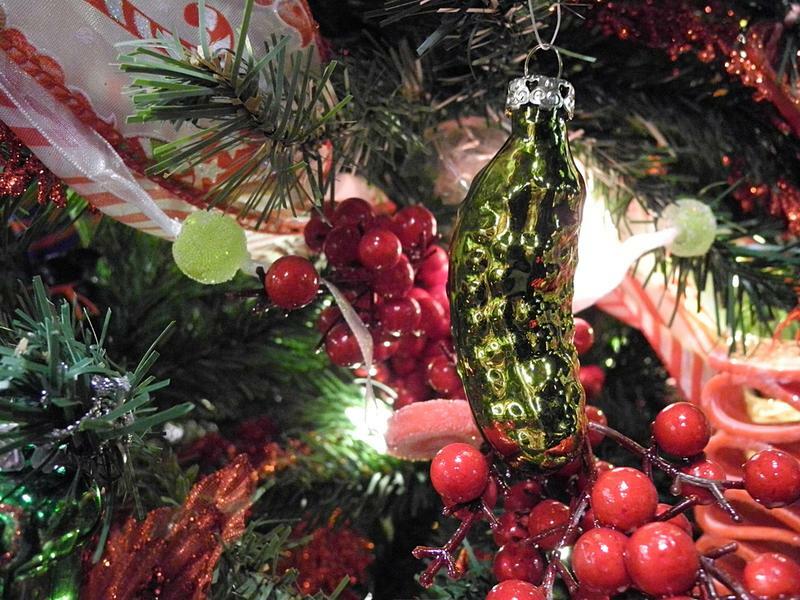 Of course, Christmas pickle ornaments are for sale, along with other pickle-related items, including chocolate covered pickles, which the people of southwest Michigan claim are delicious and popular. For fans of quirky Christmas stories, a visit to the Christmas Pickle Festival is the best way to honor die Weihnachtsgurke.